I have been busy weaving for the Woolcraft section of the Royal Geelong Show, hence the need to keep things under wraps. I just managed to finish all the items I’d put on the entry form. The first was a bright rug, that I thought it could be for the very young or even for the very old. I was inspired by a wrap I saw draped over the back of a chair at work and decided to translate it into a rug. I was able to buy some red 4 ply wool on special when I was in Bendigo, but it wasn’t quite enough so I added some 4 ply baby wool, a different red but I alternated the 2 yarns right across the warp. I dyed the brightly coloured stripes on an unexpected day off. 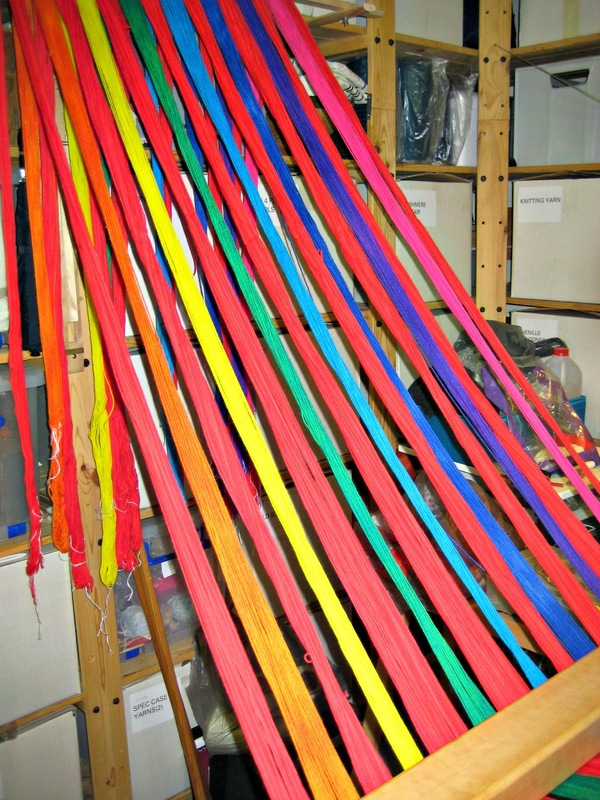 and is there anything better than a new warp all tied on and ready to start weaving? Yes it’s the same warp with all the mistakes identified and fixed, the tie up done and behaving nicely so that I’m really ready to start weaving. It wasn’t as straight forward as I thought it would be. The right sett for the yarn was 15 to 16 epi. As it was machine washable wool and I wasn’t expecting a lot of fulling, I sleyed it 2 ends per dent in an 8 dent reed. Although the yarn was all wool, it seemed to think it was mohair. The ends clung together and the first rug was pretty much a large sample. I re-sleyed in to 1 end per dent in a 15 dent reed and it behaved much better, not perfectly but much better. 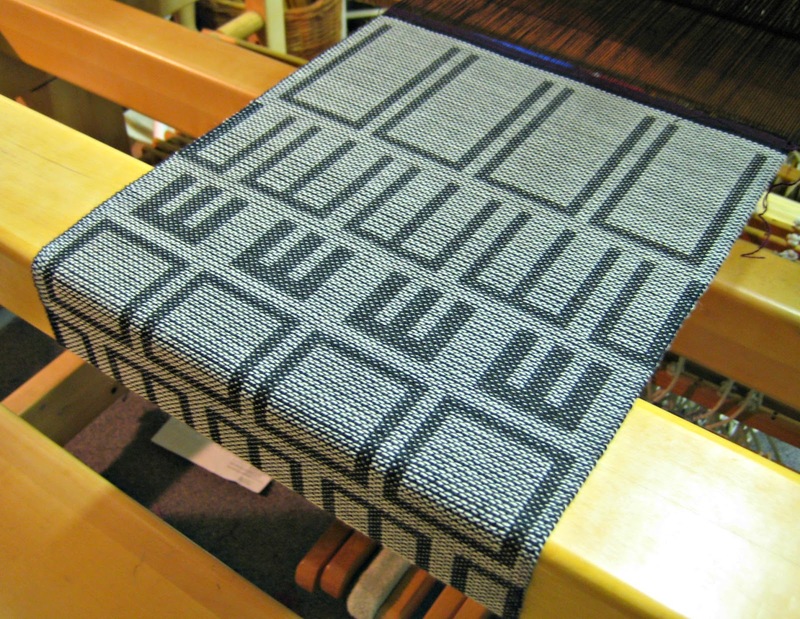 The draft was adapted from an 8 shaft advancing twill in ‘The Best of Weavers: Twill Thrills. 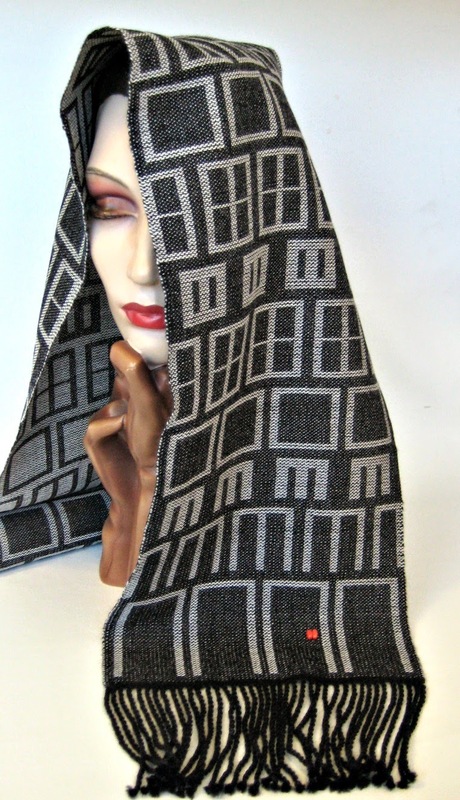 and I wrote about it July but I fancied something more geometrical for the second scarf and thought of windows. Then I read somewhere that it’s good to have a border and so ‘Windows and Doors’ was born. I experimented with the tie-up on the computer to see what sort of windows I would get. I found I had a single and two double windows and one of these turned out to have special significance. In 2012 I went to the Weaving Summer School at the Australian National University in Canberra. It was a terrific workshop where I got to play on a 24 shaft computer controlled loom for the first time. A staff member very generously offered me accommodation in her studio – a studio with a bed and a bathroom – what’s not to like? 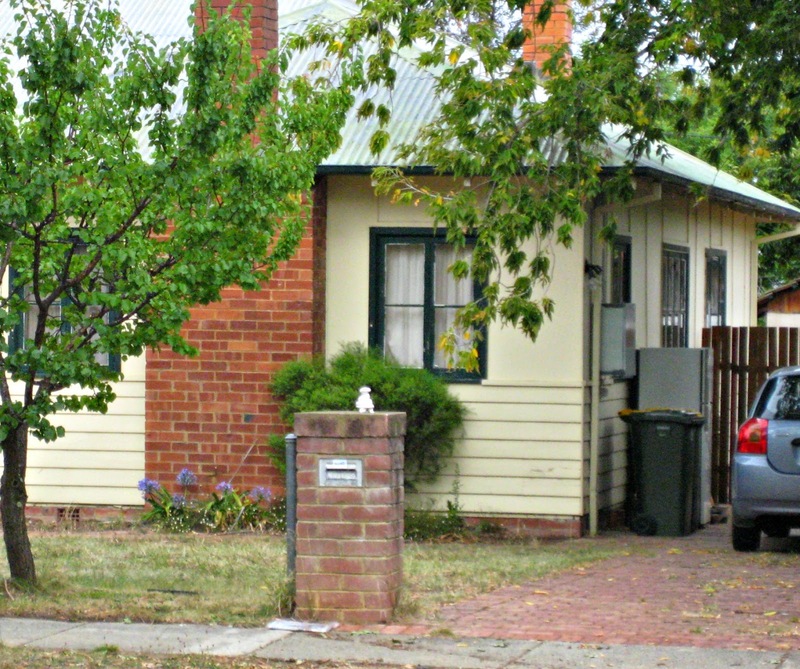 When I looked on the internet to find where I was staying I caught sight of a link to ‘Tocumwal Houses’. During the Second World War at the age of 18, my mother had joined the WAAAF – Women’s Auxiliary Australian Air Force – learned Morse Code, and with 5 of her fellow recruits had been posted to a big Air Force training base at Tocumwal, just the 6 of them and 3000 young men. 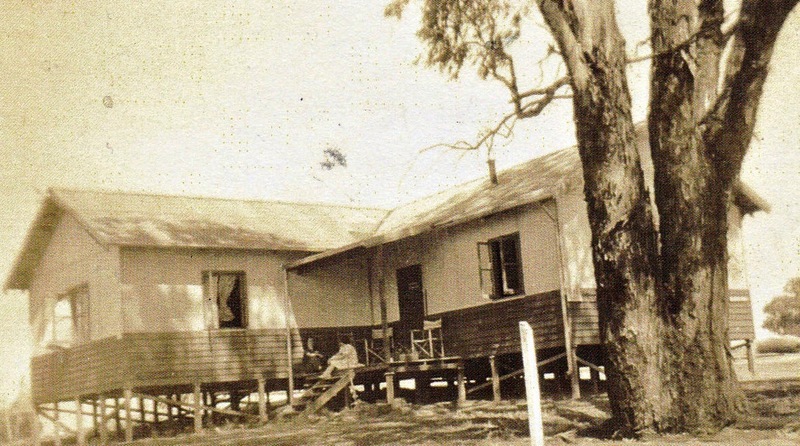 According to the oral history project, when the base was built, instead of typical long rectangular army huts, the huts at Tocumwal were house shaped. 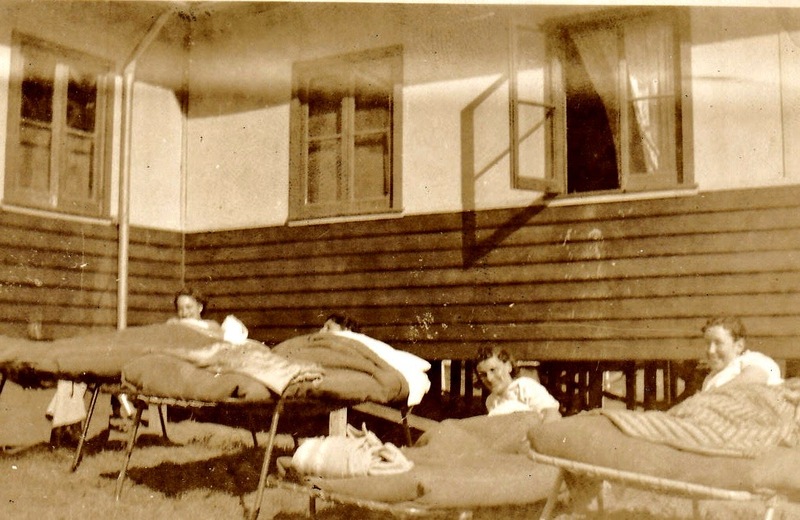 and compared them with some of my mother’s old photos and indeed the windows were an exact match (I think my mother is the one on the far left but not sure why they are sleeping outside). Of course I imagined that the house where I stayed was my mother’s old hut. So when the tie up gave me double windows, I made sure that one version had the same proportions as the windows on the Tocumwal Houses, right down to the narrow glazing bar across the middle. 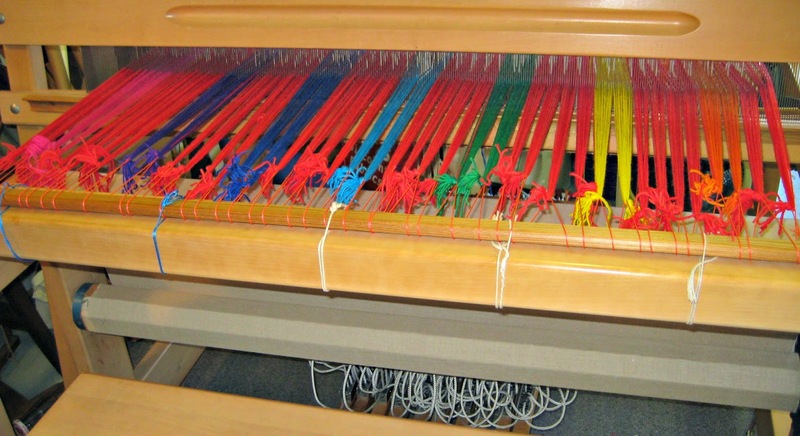 the loom. Weaving was slow because of the 2 shuttles but it was worth it and I couldn’t resist adding a knob to one of the doors. The third project was to use a lovely ball of Juniper Moon Farm Findley Dappled in soft greys, sent to me by my aunt in the US. It was 50/50 merino/silk and I thought that with a darker grey cashmere yarn from the stash for the contrast warp stripes and the weft, it could be entered in the other natural fibres class. 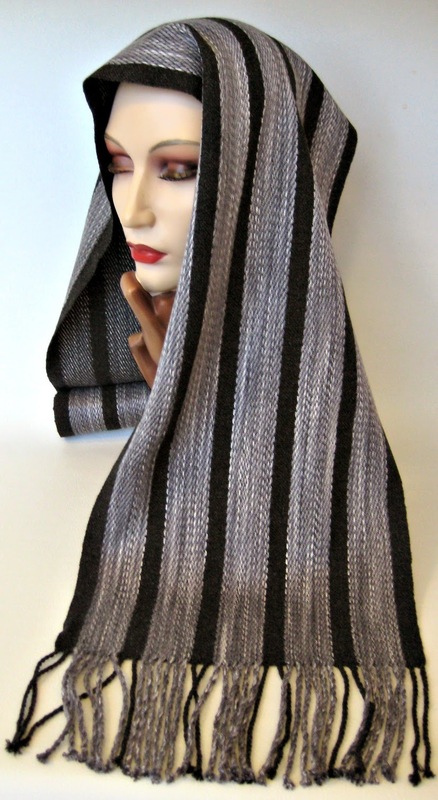 I wanted to make the most of the wool/silk and opted for satin stripes with plain weave stripes in the cashmere. I found something close to what I wanted in Sharon Alderman’s Mastering Weave Structures but there was no draft. Off to the computer and I worked it out, then I thought I had seen the same fabric in Handwoven, checked, and there was the draft in the March April 2003 issue – the shafts were a bit different as they had put the tabby on 1 and 2 and I had put it on 6 and 7 but the resulting cloth would have been the same. Weaving must be good exercise for the brain. Although the dark grey yarn was labelled ‘cashmere’, I’d bought it years ago and wasn’t completely sure what it was. Once it was wet finished there was no doubt, it was just so soft. The satin stripes with their closely sett merino/silk gave it just the right amount of weight and drape. It’s now on its way back to the US as a gift for my aunt, I hope she likes it. The judges liked what I’d done, a third prize for the red rug and blue ribbons for the two scarves. Well done, congratulations. 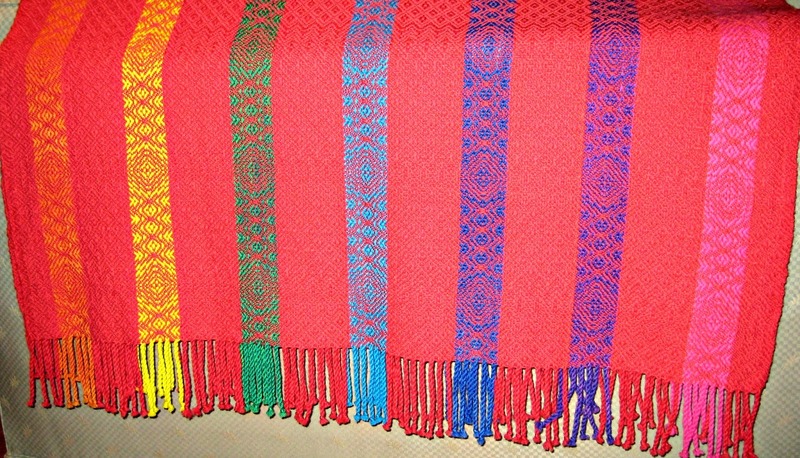 It seems you really enjoyed the design and weaving process and it shows in the results.